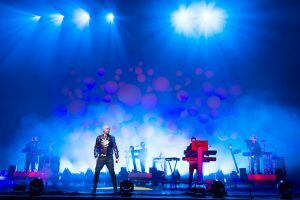 For the forthcoming September issue of Electronic Beats Magazine, editor-in-chief Max Dax met Neil Tennant and Chris Lowe of the Pet Shop Boys for the cover story. In the exchange, Tennant and Lowe look increasingly comfortable in their roles as pop’s elder statesmen, ruminating with candidness—and, of course, arch wit—on a diverse range of subjects. From Kanye West to Trevor Horn. Here’s a taster to whet your appetite. Neil: We’ve always primarily seen ourselves as songwriters. That’s the foundation of it all. This time, we considered making an album that was in one mood all the way through. I’m talking of a musical mood. We wanted the songs to be slower, more reflective, beautiful and with more sub-bass. And this is why we decided to go to Los Angeles and to work with Andrew Dawson. We knew that we’d get the backing vocals there because the city has a long tradition of professional vocal ensembles and it was clear to us from the beginning that we wanted that on many of the new songs. Elysium is different to the albums we’ve made before. For instance, some of the new songs don’t have a middle-eight, with the notable exception of “Winner”, which has one of the strongest middle-eights we have ever written. The majority of the new songs have a simpler structure though. Neil: We wanted this smoothness and elegance. That’s why we went to Los Angeles. You know, in America they have super-professionalism. In Britain we have great ideas. But it’s always about style. In America they have the professionalism of Barbara Streisand and Aretha Franklin. In Britain we have David Bowie, Mick Jagger and the Beatles. That’s why we approached Andrew Dawson who had worked on the last few Kanye West albums. The electronic sound of 808s & Heartbreak appealed to us a lot. Its sparse, spare and sort of melancholic with all this aching and all this incredible bass. When we were writing “Invisible” that particular Kanye West sound seemed like a reference point. Max Dax: When you did Yes you’ve worked together with a team of producers called Xenomania. You mentioned other producers such as Trevor Horn, Stephen Hague and Andrew Dawson. Why do you always seem to seek for a new producer instead of teaming up with someone for a longer period of time? Chris: There is definitely a hunger to seek out ways doing things differently. It’s a fascinating learning process to see how other people do things. That’s also one of the reasons why we do cover versions. We want to see how songs work and you learn it best by playing a song yourself. Max: Didn’t this annoy him? Neil: No. Once he even asked me what Trevor would have done in a certain situation. Max: And what did you tell him? Neil: Record someone jumping into a swimming pool and use it as the snare. Max: The release date of “Winner” was perfectly synchronized with the kick-off of the London Olympics—where you also presented the song for the first time live. Did you write it for the Olympics? Chris: We’ve never done it before. Neil: We were talking about anthems in our hotel in Manchester. We were discussing “We Are the Champions” by Queen—and I’ve always hated the line “No time for losers”. Max: Didn’t Freddie Mercury sing that very line at Live Aid, too?